001. What more can I say other than how proper this image is? I get we’re all busy with everyday life. Hell, it’s hard not to be busy as you grow older. But I really am feeling the vibe of this message. It’s important to wake up every morning, and keep an open mind to all possibilities and opportunities that may come out of that very day. Make the post of every day, and seize every opportunity that will come your way. Trust me; it’ll be so worth it. 002. Road trip. For quite some time now I have been craving a road trip. I need a road trip. University this year has been the hardest it has ever been, which makes it very difficult to keep up with my social life, and my blog. And I hate it has to be that way. I want more free time so that I can go on a road trip, and explore. Who wouldn’t? 003. Interior design. Fun fact – when I was younger I used to want to be an interior designer. But somebody once told me it included math, and math and I don’t go well together. At all. So there went that childhood dream. Lately I’ve wanted to redecorate my room. Paint it white, and add more natural lighting into my room so that I can feel alive every day being in my room. Unfortunately, we don’t own our house. So I can’t. 004. Motherhood. This one has been sitting heavily on my heart lately. Before anyone states the obvious, yes, I am well aware I am quite young to be thinking about children. However, there’s no harm in fantasying about how my future may pan out. You see, I love children. Not every day when I want peace and quiet, but on a good day I love children and I can’t wait to have my own one day. In fact, not only do I want one, I actually feel like I want five. For some this may be a crazy thought, for some it may be completely natural. Each to their own! Sometimes all you need are some great images to inspire you. I was on tumblr last night which I don't usually have time for and it got me going, and now I am about to write some new posts just because it got me all inspired. And on motherhood, I know you're young but it's so normal. I think babies are like the cutest things ever haha it's just a biological normal thing that your brain does and it's always nice to think about the future and dream about the awesome things you can do and the ones you'll love. I'm with Meg. I am loving this so much too! Pretty pictures seriously provide with a ton of inspiration. 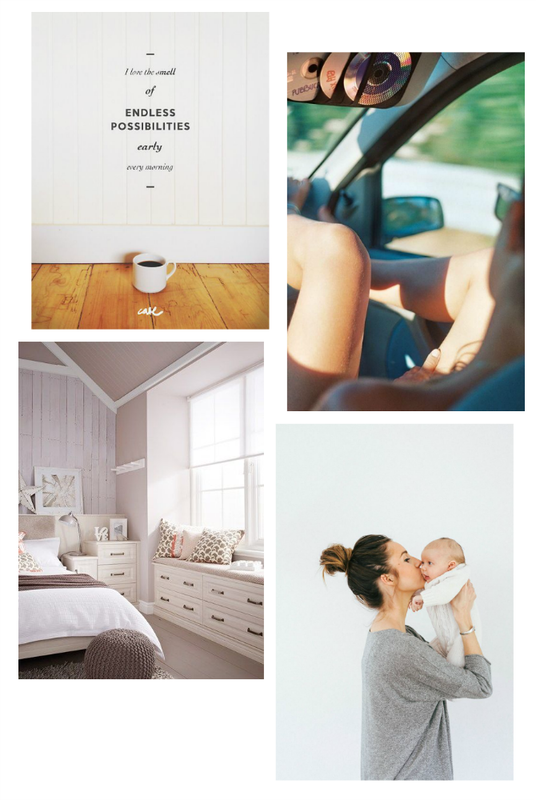 Pinterest and Tumblr = inspiration heaven! I love this post. I'm also desperate to brighten up our bedroom too and to have a good freshen up but we're hopefully selling up and moving soon so I think it would be a waste in this house. Hopefully in our new home I can get more creative interior design wise. I'm a new Mum myself with the most amazing 3 month old son that anyone could ever wish for. People always look at me like I'm insane when I say that I want 3 children. I keep it to myself that 3 is actually a minimum not a maximum as I fear this would cause permanent damage. haha. I'm not sure why a large family is so shocking to some people. I grew up in a pretty small family but have always loved the idea of a loud home full of laughter and little voices. Obviously I haven't completely lost my mind since having a child, I do know that it's not going to be easy, but that's half the fun! I wanted children from a really young age. There's no harm in looking ahead. We waited until I was 25 which feels like such a lovely age right now. oh and if you're interested and haven't already, let's follow each other! do let me know. Oh girl, I get you with the kids one. super sweet inspirations! love the vsco inspired photo effects! Lovely post and too funny, I actually happen to know the girl in your motherhood photo, I went to school with her haha small world! It's funny how the social media/blogging connects people around the world.